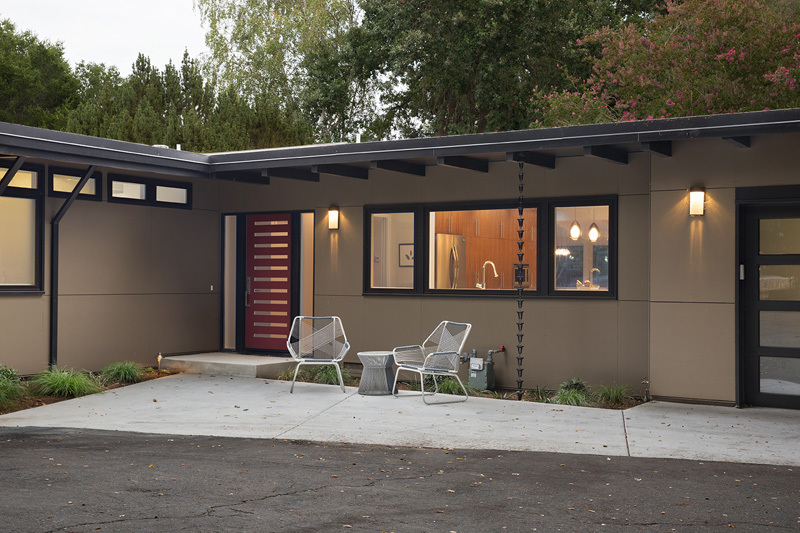 Klopf Architecture were asked by their clients to remodel a run-down mid-century modern house, located in Lafayette, California. 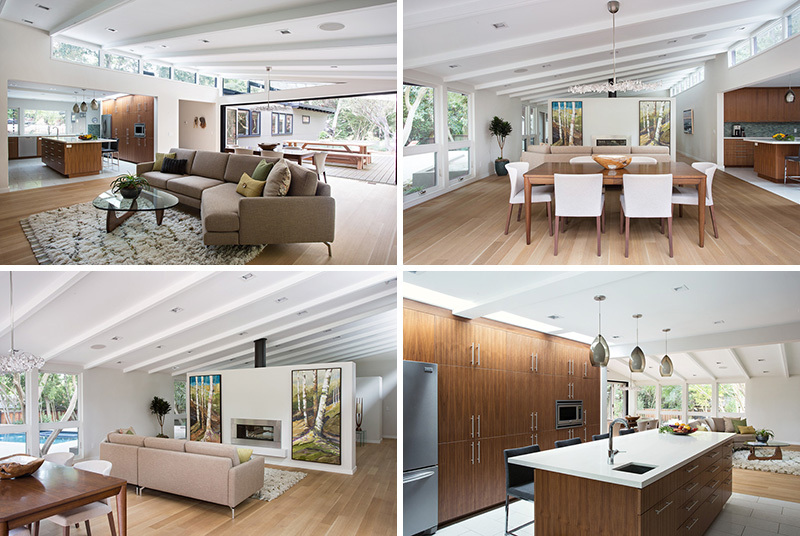 Klopf Architecture worked together with Envision Landscape Studio to re-imagine the house and property as a unified, flowing, sophisticated, warm, modern indoor / outdoor living space for a family of five. 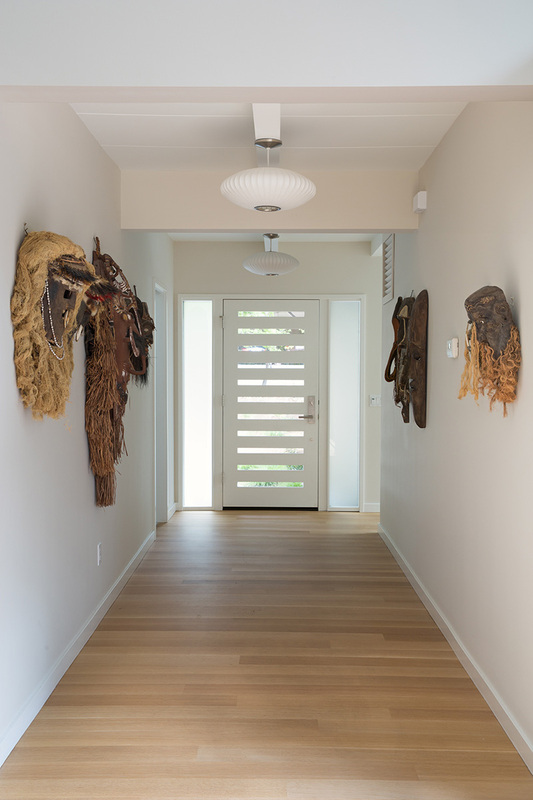 Welcoming you to the home, is an entrance hallway lined with tribal masks. 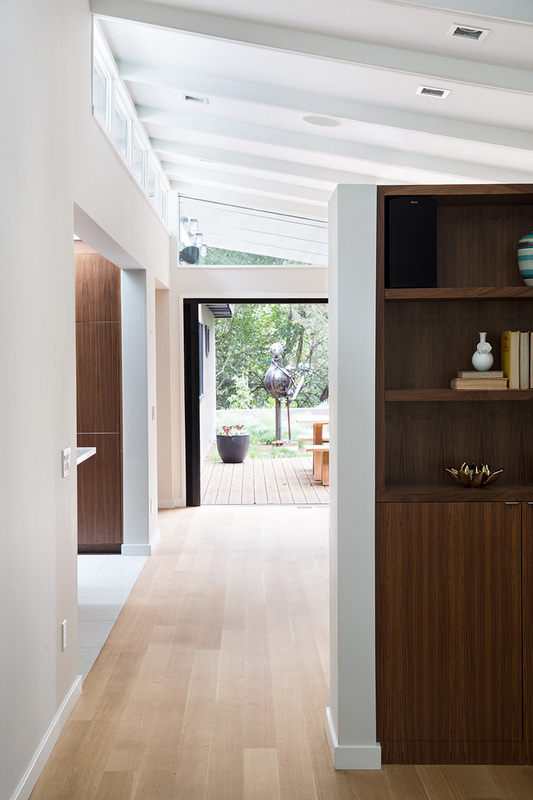 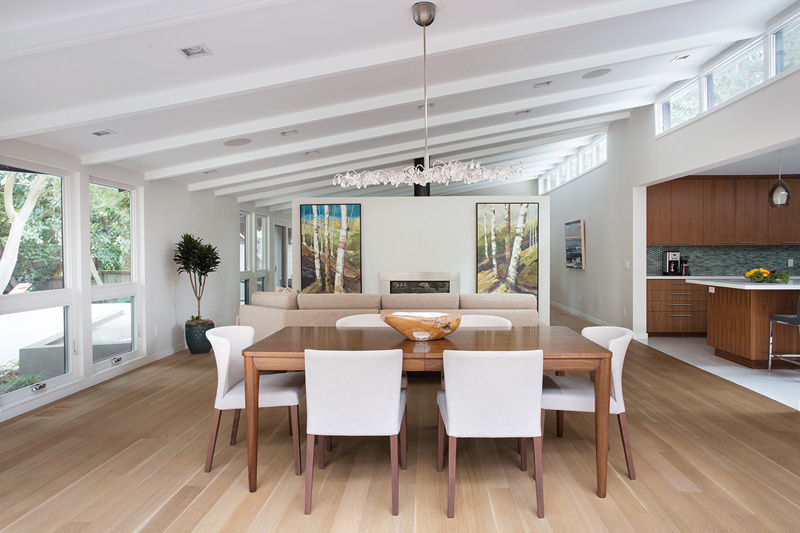 The architects opened up the wall with a La Cantina folding door system, connecting the interior living space to a new wood deck that acts as a continuation of the wood floor. 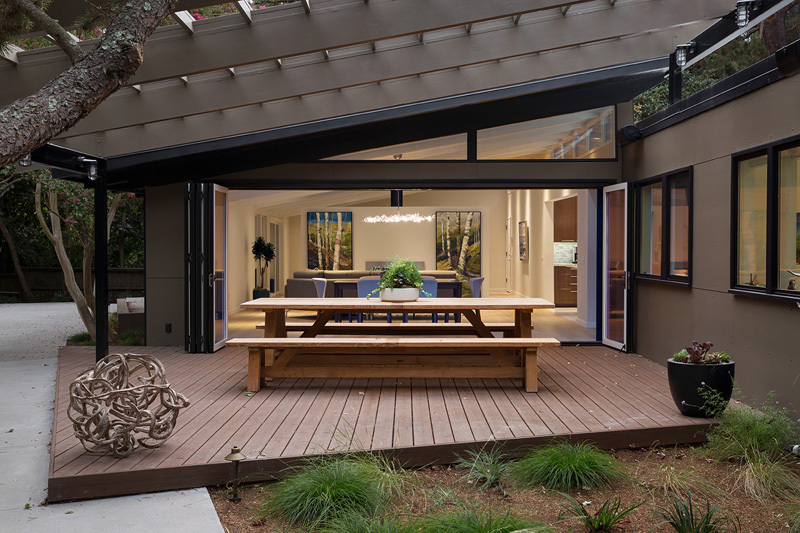 By opening up the wall, this allows people to flow from kitchen to the living / dining room and the deck seamlessly, making the main entertainment space feel at once unified and complete, and at the same time open and limitless. 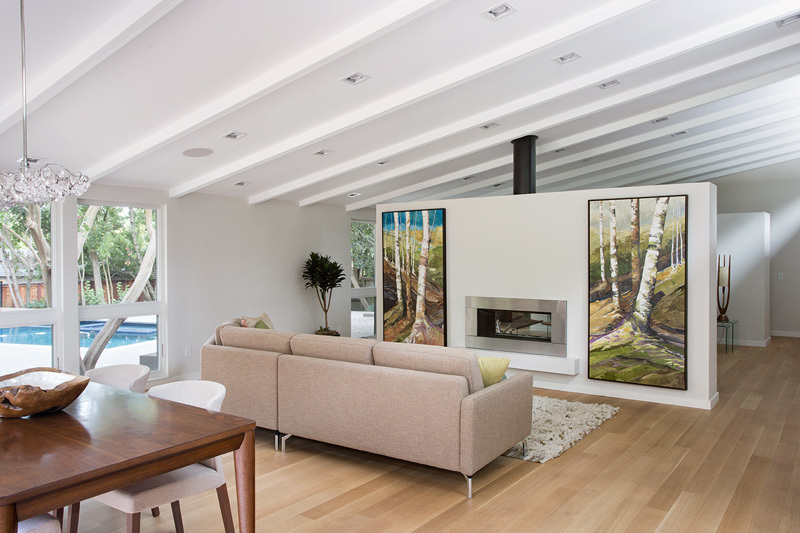 The home was staged by The Design Shop, except for the two large pieces of artwork that flank the fireplace, they are the home owner’s art. 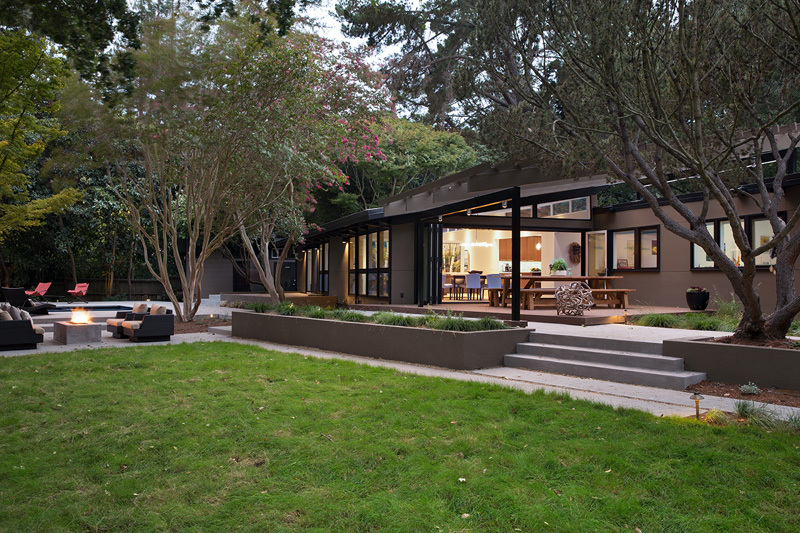 Here you can see just how open the space has become. 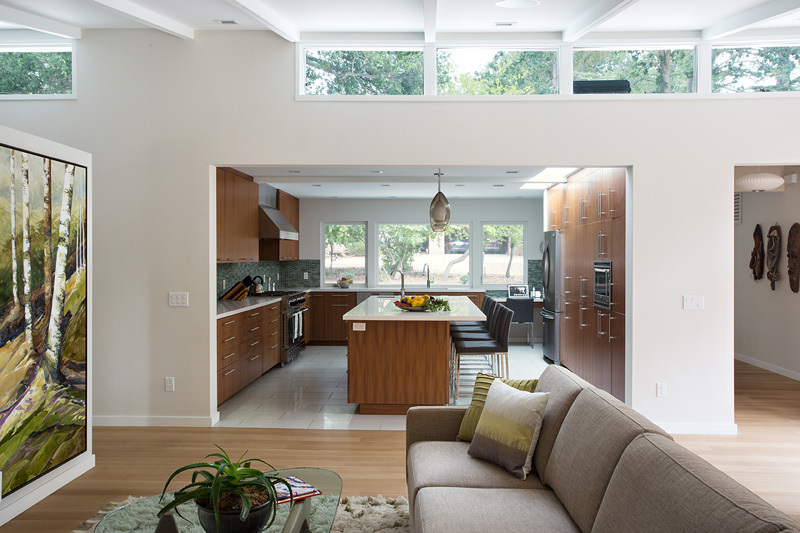 The old kitchen was replaced with a spacious cook’s kitchen, complete with a row of skylights bringing light into the space. 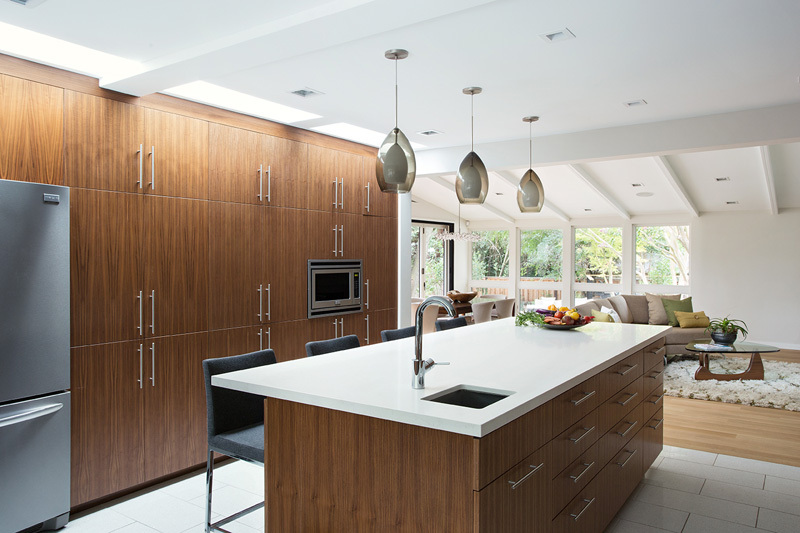 A large central island with seating provides an additional eating space. 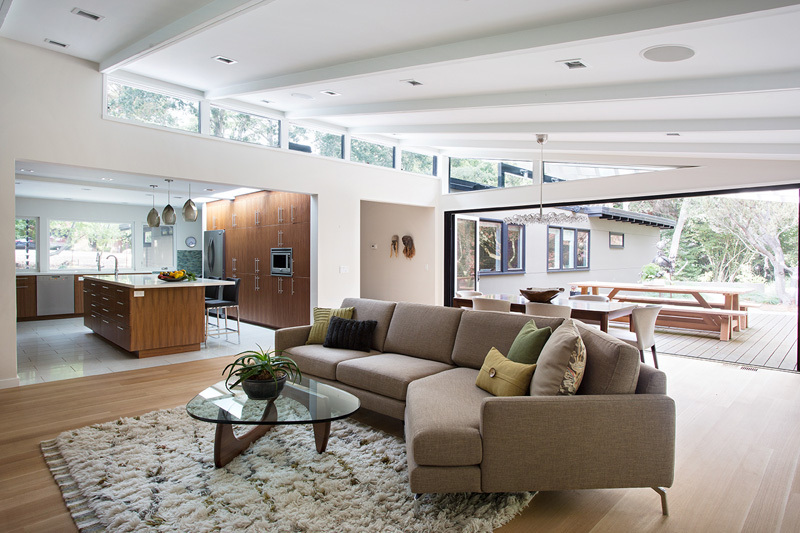 On the other side of the fireplace, an additional sitting area is hidden from view. 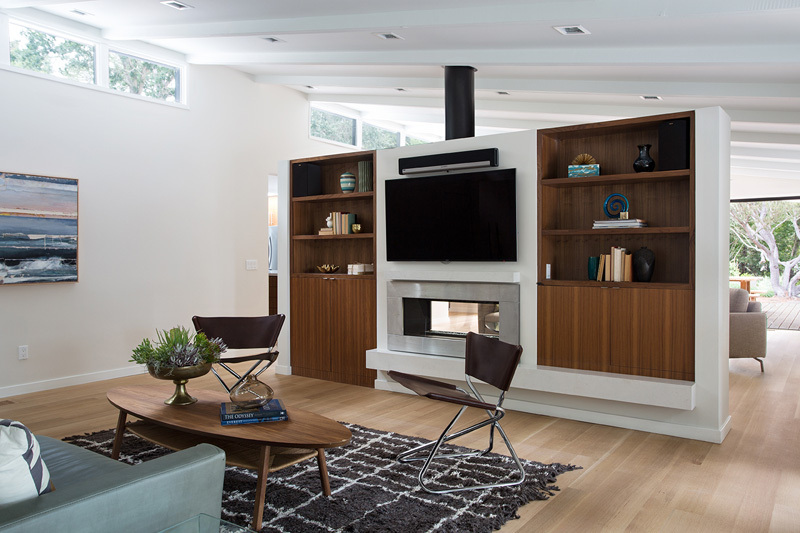 This time, shelving flanks the fireplace, with a flat screen TV hung above. 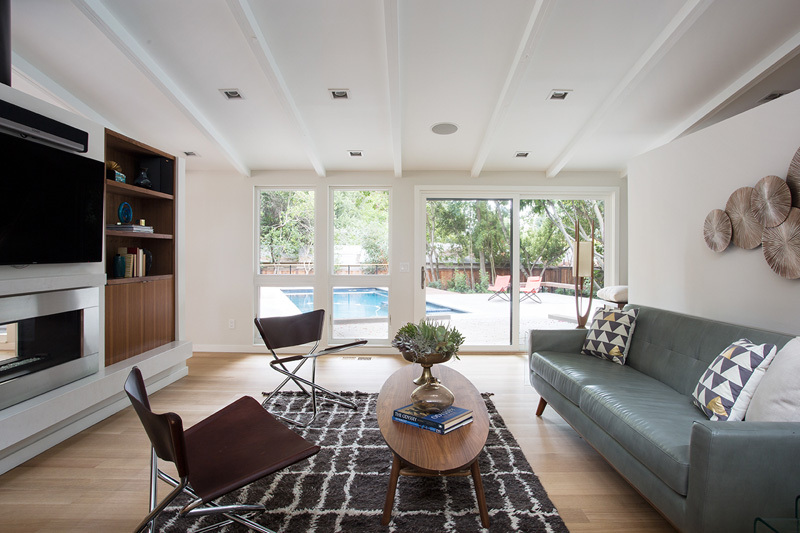 Windows and doors provide a view of the backyard and pool. 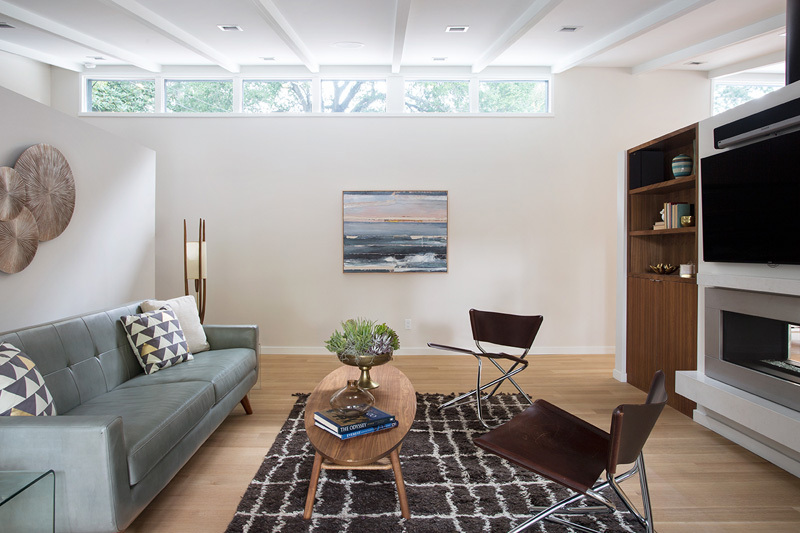 The home features a sloped roof with a row of windows to allow the natural light to flood the room. 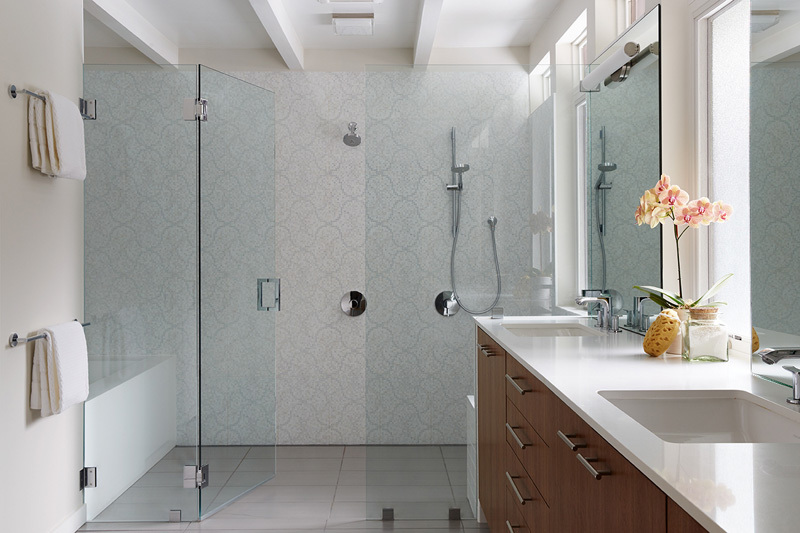 A large wet room housing the shower and bath, is partitioned off by a glass from the rest of the bathroom.